Eva: Why do you look like that? Me: Because I want to make my skin look pretty. Eva: Can I lick the chocolate off your face? Me: It’s not chocolate. It’s clay and honey. Eva: Is that from a muddy puddle? Me: No, honey, it’ super special clay that Melissa collects when she’s hiking in the mountains. Eva: Can I have some on my face, too? She wasn’t so sure about it. Me, though? I loved it! Do you remember playing in sticky mud when you were a kid? What’s not to love? Apart from the entertainment factor, the reason I love this product is because it made my skin so soft and moisturized. 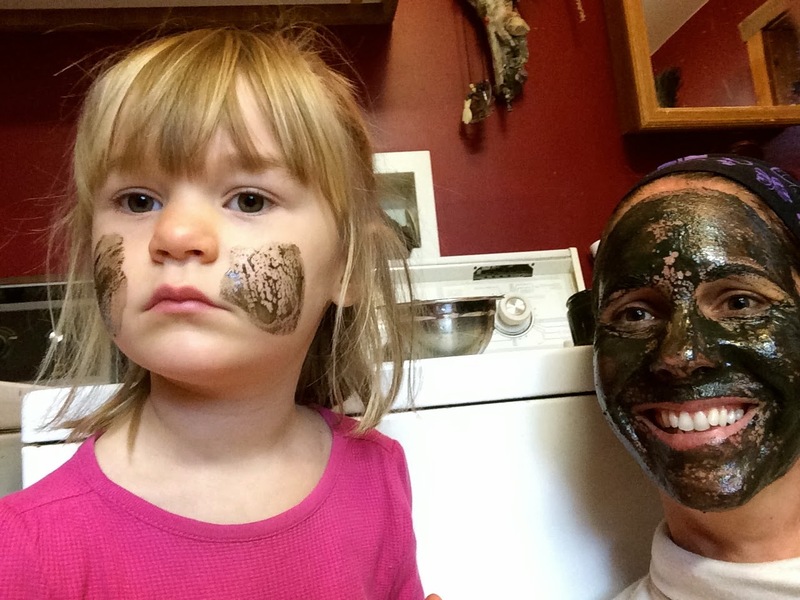 I was a little nervous about putting a mask containing clay on my super sensitive, dry skin. 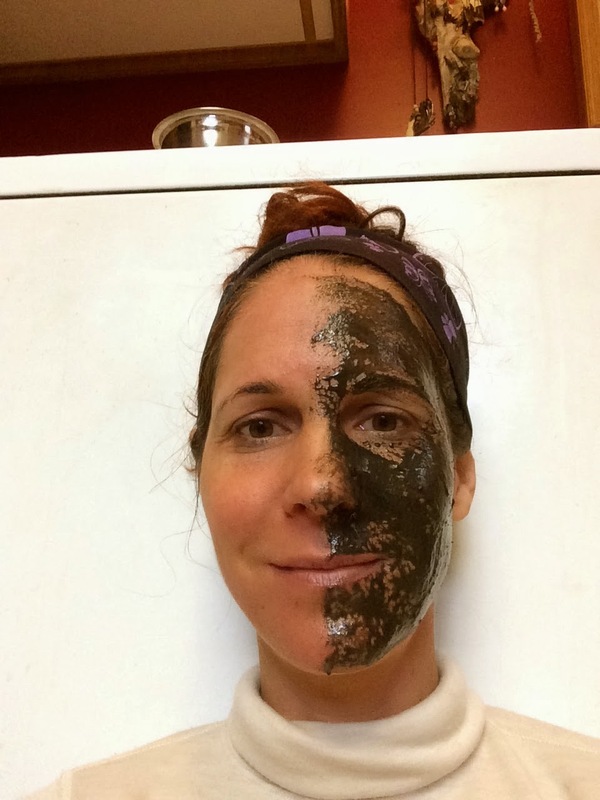 I’ve had bad experiences with clay before, leaving my skin stressed and even drier. Not this mask. 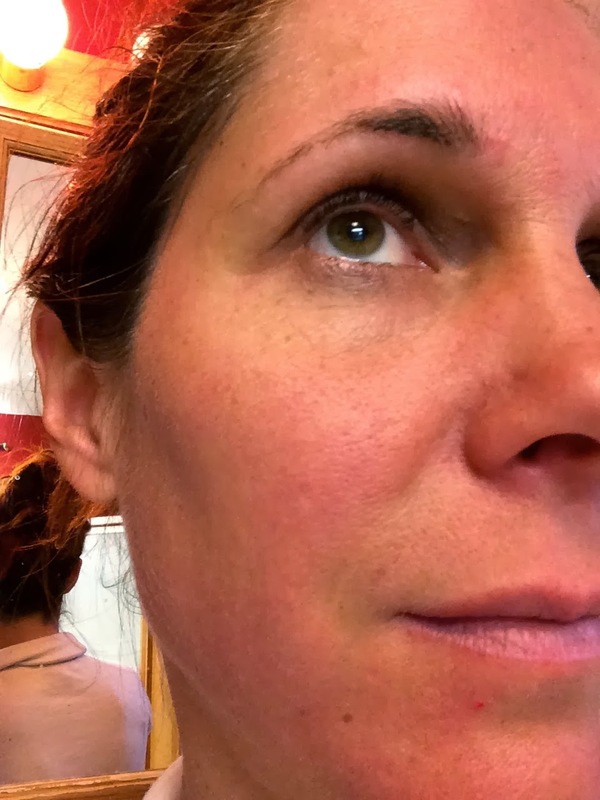 Melissa puts honey and jojoba oil in it, which are both incredibly moisturizing. I didn’t have any directions on how to apply this and how long to leave it on, so I just opened the jar, put my finger in it, and tried to put it on my skin. That didn’t work, because it was too thick, so I mixed it with a little water, and – voila! It adhered to my face like a charm. I noticed immediately that this mask is different than other products I’ve tried before finding Honey Bee Holistics. The minute I put it on, I felt nourished. I also noticed some gentle exfoliating effect, probably from the oatmeal. Eva kept asking me funny questions, which made me laugh. When I opened my mouth, I noticed the taste of honey. Yum! I had to remind myself not to lick my lips and eat the stuff, especially since it looks like chocolate fudge. 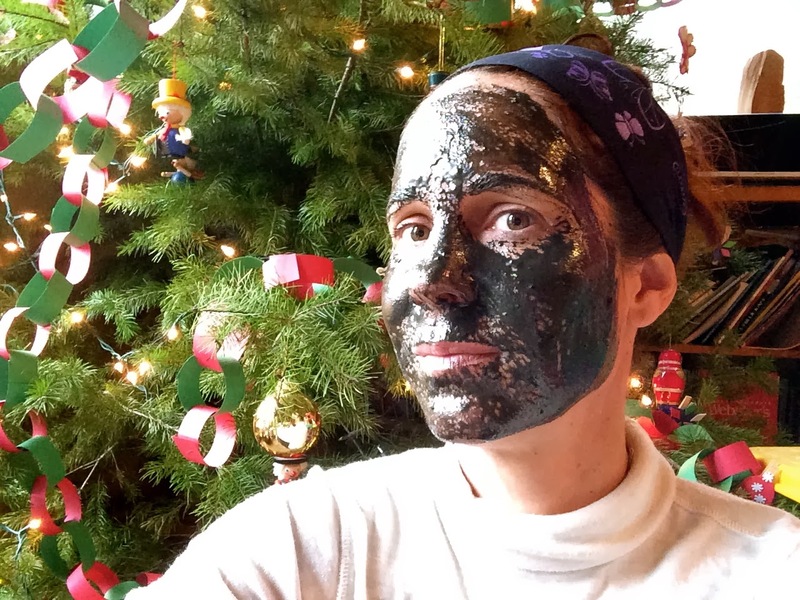 I left the mask on while I told Eva stories under the Christmas tree. After 30 minutes, I decided to take it off. It never dried, which I love, because whenever clay dries, it pulls on my skin and kind of hurts. The mixture came off nicely with a warm wash cloth. My skin felt amazing! I never even put moisturizer on my skin afterwards! I usually HAVE to put lotion on after washing my face, even if it’s just with water. But with this mask, I didn’t need to. Even now, hours after removing it, I know I won’t have to put any moisturizer on my face until tonight, after my shower. Wow!!! I told you I was having fun with this product! See? Nice and rosy skin! 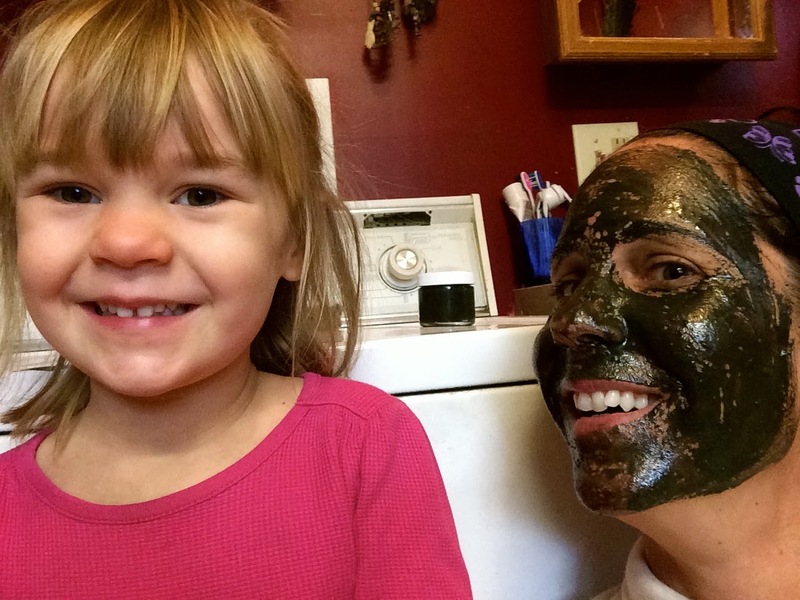 Now for YOUR chance to WIN a 2oz jar of YOUR OWN Organic Honey Clay Face Mask customized to YOUR skin type! Enter below!! Please don’t forget when you get to the entry for commenting that you comment here on the blog post, and not in the giveaway link box!! Thanks!! Good luck!